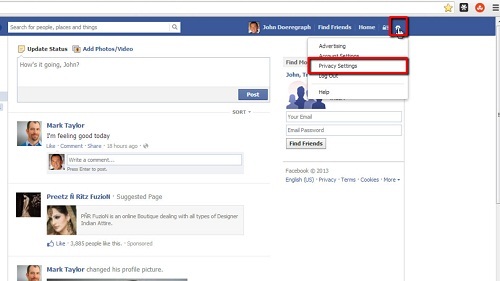 In this tutorial, you are going to learn how to force Facebook logout. You may have left your account logged in on another computer, or you may suspect that someone else has gained access to your account. This tutorial will show you how to force your account to be logged out wherever it is logged in. First, go to www.facebook.com and make sure you are logged into your Facebook account. Then click on the gear icon in the upper right-hand corner of the screen, and choose the “Privacy Settings” option from the drop-down menu. 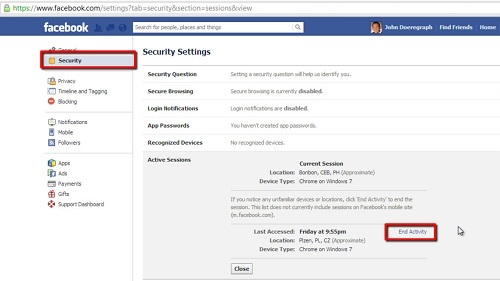 Next, from the navigation options on the left-hand sidebar, click on “Security.” A list of security settings will come up and you will choose the last security setting in the list: “Active Sessions.” Click the “Edit” option on the right and all active logins will come up. Simply click “End Activity” to logout any instances. And that’s it, you have now learned how to force Facebook logout.